There are several types of stand up paddle boards (SUP) available to the public today, race boards, touring boards and general use boards. The general use board is what most people associate with stand up paddle boarding. The general SUP looks like an oversized surf board. Since SUP boards originated in the surf world, this is the oldest and most common type of SUP board. The key difference between a SUP board and a surf board is the volume. The SUP board is designed to provide the user with a platform which can float on the surface of the water without any momentum. 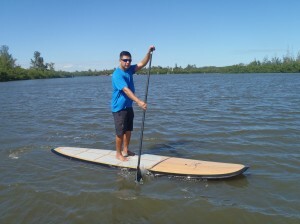 Most modern SUP boards come in a variety of sizes and shapes, all working to fill the users’ needs. Most boards range in length from 12 to 8 feet long. In addition to difference length, the width of the board can also vary, from 33 inches to as narrow as 27 inches. In addition to the difference in sizes, the general purpose boards also come in a vast array of shapes. Many boards offer an elevated rocker (nose), which allows the board to be used for greater surf performance. The different sizes are out there to give individuals a choice of boards which will fit their need, whether looking for a board which can be surfed with high performance or a great flat water board or a board which can be used for an all-around board, these general purpose boards are designed to fit your need.Most general purpose SUP boards come equipped with either a single fin or a three fin configuration. This difference in fin configuration is again designed to meet the users’ needs. If a user wants a board which has higher performance in the surf, then the three fin thruster configuration might be the way to go. Other users are looking for a board which will track straighter on flat-water, therefore a larger single fin configuration might be the way to go. Most individuals who are looking to purchase their first stand up paddle board will get a general purpose board. This will allow them to experience the amazing sensation of walking on water and provide them a platform which they can use in the surf or the flat-water. Contact SUP Eco Adventures at www.supecoadventures.com or via email supecoadventures@gmail.com for more information on stand up paddle boards. This entry was posted on October 14, 2012. It was filed under SUP Blog.